Professor Gabrielli completed his undergraduate education at James Cook University in Townsville and PhD at La Trobe University in Melbourne. 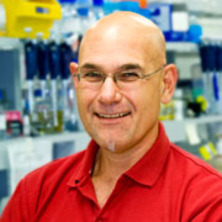 After two postdoctoral positions in the USA in the emerging field of cell cycle regulation, he was recruited to establish his own independent research at the Queensland Institute of Medical Research, and then recruited to the Diamantina Institute in 2002, and Mater Research Institute in 2016. He is head of the Smiling for Smiddy Cell Cycle Group. Mechanisms that regulate cell division, particularly progression into mitosis. These mechanisms are often mutated in cancers and are likely to be major contributors to cancer development. Identifying the genetic mutations that disrupt normal progression and particularly mechanisms, known as checkpoints, provides diagnostic and prognostic opportunities. It also provides potential new targets for chemotherapeutics as drugs targeting defective checkpoints have tumour selective cytotoxic potential. Identifying the molecular basis for defective checkpoints in melanoma. Targeting defective cell cycle responses to ultraviolet radiation, replication stress and TopoII inhibitors in melanoma, and investigating whether the same defects in other cancer types respond to similar targeting. Do Histone deacetylase inhibitors target cell cycle checkpoints that monitor heterochromatin structure? Gabrielli, Brian (2006). Cell Cycle Targets of Histone Deacetylase Inhibitors. In Eric Verdin (Ed. ), Histone Deacetylases: Transcriptional Regulation and Other Cellular Functions (pp. 299-314) Berlin: Humana Press. Finally, how histone deacetylase inhibitors disrupt mitosis! Lindemann, Ralph K., Gabrielli, Brian G. and Johnstone, Ricky W. (2004) Histone-deacetylase inhibitors for the treatment of cancer. Cell Cycle, 3 6: 779-788. Pavey, S. and Gabrielli, B. G. (2004) Analyzing checkpoint controls in human skin. Methods in Molecular Biology, 280 1: 175-183. Gabrielli, B, Warrener, R, Beamish, H, Burgess, A and Waterhouse, N (2002) Tumor-selective toxicity of histone deacetylase inhibitors is due to their targeting cell cycle checkpoint points. European Journal of Cancer, 38 S95-S95. Pavey, S. and Gabrielli, B. (2002) alpha-melanocyte stimulating hormone potentiates p16/CDKN2A expression in human skin after ultraviolet irradiation. Cancer Research, 62 3: 875-880. Pavey, S. J., Conroy, S., Russell, T. and Gabrielli, B. (1999) Ultraviolet radiation induces p16CDKN2A expression in human skin. Cancer Research, 59 17: 4185-4189. Castellano, M, Pollock, PM, Walters, MK, Sparrow, LE, Down, LM, Gabrielli, BG, Parsons, PG and Hayward, NK (1997) CDKN2A/p16 is inactivated in most melanoma cell lines. Cancer Research, 57 21: 4868-4875. Wang, XQ, Gabrielli, BG, Milligan, A, Dickinson, JL, Antalis, TM and Ellem, KAO (1996) Accumulation of p16(CDKN2A) in response to ultraviolet irradiation correlates with a late S-G(2)-phase cell cycle delay. Cancer Research, 56 11: 2510-2514. Gabrielli, BG, DeSouza, CPC, Tonks, ID, Clark, JM, Hayward, NK and Ellem, KAO (1996) Cytoplasmic accumulation of cdc25B phosphatase in mitosis triggers centrosomal microtubule nucleation in HeLa cells. Journal of Cell Science, 109 1081-1093. Ogg, Scott, Gabrielli, Brian and Piwnica-Worms, Helen (1994) Purification of a serine kinase that associates with and phosphorylates human Cdc25C on serine 216. Journal of Biological Chemistry, 269 48: 30461-30469. Morrice, Nicholas A., Gabrielli, Brian, Kemp, Bruce E. and Wettenhall, Richard E. H. (1994) A cardiolipin-activated protein kinase from rat liver structurally distinct from the protein kinases C. Journal of Biological Chemistry, 269 31: 20040-20046. Gabrielli, Brian G., Lee, Margaret S., Walker, Duncan H., Piwnicaworms, Helen and Maller, James L. (1992) Cdc25 regulates the phosphorylation and activity of the Xenopus cdk2 protein kinase complex. Journal of Biological Chemistry, 267 25: 18040-18046. Gabrielli, Brian G., Roy, Linda M., Gautier, Jean, Philippe, Michel and Maller, James L. (1992) A cdc2-related kinase oscillates in the cell cycle independently of cyclins G2/M and cdc2. Journal of Biological Chemistry, 267 3: 1969-1975. Lee, W. J., Skalamera, D., Dahmer, M., Shakhbazov, K., Purdon, A., Wilson, B., Ranall, M, Pinder, A., Pavey, S., Gonda, T. and Gabrielli, B. (2012). A Genome-wide Human ORF Gain-of-function Screen to Identify Genes that can Bypass p16INK4a-mediated Cellular Senescence. In: 6th Australian High Content Screening Group Meeting, Melbourne, Australia, (). 13th July 2012. Lee, W. J., Skalamera, D., Dahmer, M., Shakhbazov, K., Ranall, M., Purdon, A., Wilson, B., Pinder, A., Pavey, S., Gonda, T. and Gabrielli, B. (2011). A functional genomics approach to identify genes and pathways that can bypass p16INK4a-mediated cellular senescence. In: 14th Annual Australian Cell Cycle Workshop, Noosa, Australia, (). 24 October 2011. Lee, W. J., Skalamera, D. and Gabrielli, B. (2011). A high-coverage and high-content human ORF overexpression screen to identify pathways that can bypass p16INK4a-mediated cellular senescence. In: 5th Australian High Content Screening Group Meeting, Melbourme, Australia, (). 15 July 2011. Is the heterochromatin checkpoint a useful anti-cancer drug target? The role of MEK1 in progression through G2/M phase of the cell cycle.